Handy tool aids in applying straight-line torque for fast, easy installation of the barrel nut without scratching the exterior of the upper receiver. Helps ensure the right amount of torque is evenly applied, while maintaining proper alignment of the barrel, upper receiver, and gas tube ports. Use with any barrel nut wrench or free-float tube wrench and a torque wrench with a ½" square drive. Simply clamp the barrel nut wrench handle firmly in a bench vise, insert the barrel into the upper receiver, and finger tighten the barrel nut. Slide the barrel through the wrench, insert the Torque Tool in the back of the receiver until the teeth lock into the locking lugs in the barrel extension, and apply torque with the torque drive through the Tool to tighten the barrel nut. 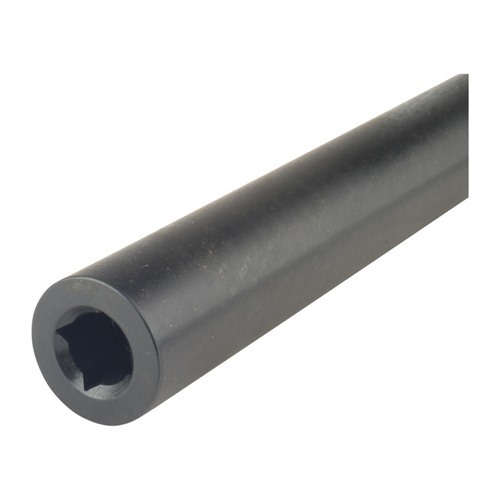 Precision machined from heavy-duty steel bar stock for years of reliable service. ?Available for the 308 AR. NOTE: Will NOT fit the DPMS G2 versions. SPECS: Machined steel, black oxide finish. 10” (25.4cm) long, 1.18” (3cm) diameter. Requires a ½” square drive torque wrench. Instructions included. 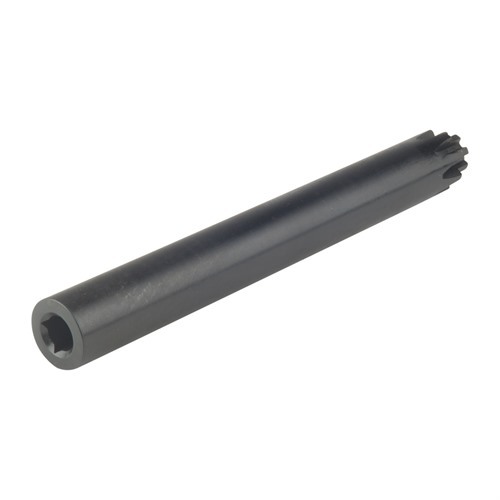 Fits .308 DPMS pattern uppers/barrel extensions EXCEPT the new G2 versions. Praktisk verktøy hjelpemidler i bruk lineær Moment for rask og enkel installasjon av tønna mutteren uten å skrape utsiden av den øvre mottakeren. Sikrer riktig mengde dreiemoment jevnt brukes, samtidig opprettholde riktig justering av fat, øvre mottaker og gass tube porter. Bruk med noen fat mutter fastnøkkel eller fri-flyt tube fastnøkkel og en momentnøkkel med en ½" square stasjon. Bare klemme fat mutter fastnøkkel håndtere fast på en benk vise, sette inn fat i øvre mottakeren og finger stram tønna mutteren. Skyv sylinderen gjennom skiftenøkkelen inn verktøyet dreiemoment på baksiden av mottakeren til tennene låsen låsing lugs i tønnen utvidelsen og bruke dreiemoment med dreiemoment stasjonen gjennom verktøyet å stramme tønna mutteren. Presisjon maskinert av heavy-duty stål for år med pålitelig service. ? Tilgjengelig for 308 AR. notat: vil ikke passe DPMS G2 versjonene. Spesifikasjoner: maskinert stål, sort oksid slutte. 10"(25,4 cm) lang, 1,18" (3 cm) diameter. Krever en ½" square stasjon momentnøkkel. Instruksjoner inkludert. Passer 308 DPMS mønster overdel/fat extensions bortsett fra den nye G2 versjonen. 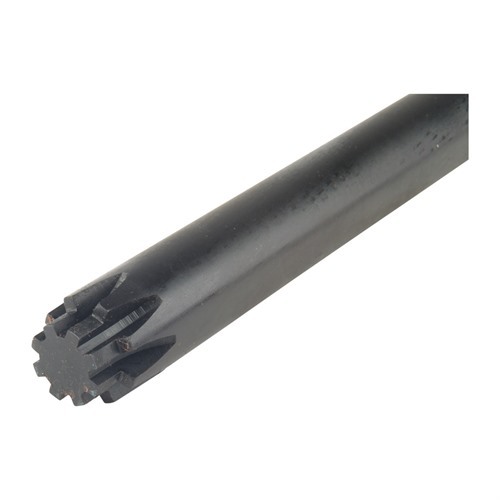 This tool is a 'must have' for the barrel installation on milled billet uppers as they will not fit in the normal vice blocks. The way it is described it seems complicated, but it isn't. It is a very simple operation that puts the pressure - torque on the barrel nut, not the upper. It fits into the receiver with very minimal 'slop' so your alignment stay right on line. I use it on all my uppers now, the vice blocks are now gathering dust on the work bench. As the previous reviewer stated, this tool is a must for barrel installation on most any 308 AR platform! I have now used it on 3 different 308 builds (Aero M5 & DPMS) and it has performed flawlessly! The tool does not transfer torque to the upper receiver as most vise blocks do and simply eliminates the possibility of scratching or marring the uppers finish during barrel nut installation. One other "Pro" to consider with this tool is cost, it comes in at a fraction of similar tools such as the "Geissele Reaction Rod". Although this can be easily corrected with a grinder, my only complaint with the tool is no flats were machined into the rear section such as Geissele chose to do with their version. If this were addressed by Brownell's I think this tool would have been perfect! Ditto other comments; very small distance between barrel nut wrench and this tool's point of contact is the key. For both this and the smaller AR size, I agree with others that vise flats would be REALLY nice. I just went down to the hardware store and paid a few bucks for a 3-foot chunk of 1/2" square steel bar stock, then cut off a couple inches to clamp in the vise. Or you could try any of the adaptations of socket adapters mentioned in the AR-15 tool reviews. Both this AND Brownell's AR-15 equivalent (plus that chunk of bar) cost less than Geissele's AR version, and that was at full list price! Must have tool for AR work. I would have given it five stars if it had flats on it like the Geisselle tool. As it comes, it will spin in the vise. I took the grinder to it (don't bother milling it, as it is harder than woodpecker lips) and now it is perfect. Brownell's, please change this one thing and you will have a hands down winner. Way cheaper than the aforementioned tool as well. Safest way to torque your barrel nut. I don't use the clamshells anymore now that I have this. Like everyone said, this is much cheaper than the Geissele and works great. I too wish it have vise flats instead of being completely round, but I also wish it was 2 inches longer. I know adding light will increase the price, but it will be worth it to allow more room to do more than adding a barrel nut. I used mine to install a flash suppressor. It was just barely long enough for the vise to hold securely and for me to have enough room to work. Overall, I would buy this over the $200 Geissele anyway. Please check out the great Brownell's tutorial on Youtube to find out how to use this. In practice, you place your upper, with barrel and barrel nut affixed hand-tight, muzzle-down through a crows foot or armorer's wrench that hat been locked horizontally in your bench vise. This fixes the barrel nut and when you place this device in your barrel extension, the splines lock against the barrel extension, just as your bolt would. Now, when you attach your 1/2" drive torque wrench to the tool, your twisting rotates the barrel against the barrel nut, with no forces transferred to your upper itself. If you want to use it upright, similarly to the more expensive options from Geiselle and Kley-Zion, you can. Since there are no flats on this tool, it will rotate in your vise when you apply torque. What you can do is get a breaker bar (also called a flex handle) with flat faces at the end that will clamp in your bench vise. With the 1/2 driver of the breaker bar protruding above the vise but locked upright by the vise jaws, and the breaker bar braced against the body of your vise to limit sidelong rotation, you can now place the end of the Extension Torque tool on the 1/2 driver without fear of it twisting as you work. Careful not to apply only downward and rotation force so the tool does not come up off of the driver. I hope these tips are useful to you! Using both approaches, I was able to attach a BA 20" barrel to my new Aero Precision LR 308 upper and also time a VG6 Gamma 762 Muzzle Brake perfectly. Just a pleased customer wanting to share my positive experience and tips to save you a bit of money versus the alternatives. I paid full boat for the tool and have not been compensated in any way for this review. Wrote a in detailed review but they have a profanity detector that will not let it pass. I used 0 profanity. No flats makes everything difficult with this tool. Can not lock it into Vice. Have to lock barrel nut wrench into the vice and that does not work well. I am a hobby gunsmith. I enjoy building AR rifles. I have used both this tool and the AR-15 tool. They work. I find them very easy to use. They put very little stress on the upper receiver. read the included instructions. Produsentnr. : 100571 050806110847 Praktisk verktøy hjelpemidler i bruk lineær Moment for rask og enkel installasjon av tønna mutteren uten å skrape utsiden av den øvre mottakeren. Sikrer riktig mengde dreiemoment jevnt brukes, samtidig opprettholde riktig justering av fat, øvre mottaker og gass tube porter. Bruk med noen fat mutter fastnøkkel eller fri-flyt tube fastnøkkel og en momentnøkkel med en ½" square stasjon. Bare klemme fat mutter fastnøkkel håndtere fast på en benk vise, sette inn fat i øvre mottakeren og finger stram tønna mutteren. Skyv sylinderen gjennom skiftenøkkelen inn verktøyet dreiemoment på baksiden av mottakeren til tennene låsen låsing lugs i tønnen utvidelsen og bruke dreiemoment med dreiemoment stasjonen gjennom verktøyet å stramme tønna mutteren. Presisjon maskinert av heavy-duty stål for år med pålitelig service. ? Tilgjengelig for 308 AR. notat: vil ikke passe DPMS G2 versjonene.